It took awhile before I became okay with the idea of drinking wheatgrass juice. In realizing the benefits of wheatgrass it was something I didn’t want to miss out on. Wheatgrass shots at your local health food store can be very pricey. So, last spring we started to grow our own wheatgrass for it’s health benefits. Currently, I take wheatgrass shots about once a week to boost the Vitamin K in my system (did this w first pregnancy, too). This way we can opt out of our son receiving the Vitamin K shot after birth -unless there are visible signs of bruising. Be sure to consult your midwife or physician if your are pregnant or nursing before consuming wheatgrass. In any case, we set up a seed starter tray with soil and planted wheatgrass. Growing wheatgrass, otherwise known as, “Liquid Sunshine” is very easy to do. Wheatgrass grows quickly. It only takes 3-5 days to emerge in soil 1/8 of inch deep. You can grow it all year round but the preferred temps for wheatgrass to grow is between 50-80 degrees. In warmer climates where I live it will grow too fast and turn yellow quickly and wilt. Therefore, wheatgrass is great to grow in a window box which is what we did after a few attempts in the high heat. Wheatgrass is a uniform green foliage that it gives off a beautiful look when planted into a small pot or tray. It’s vibrant green color is the beholder of it’s many advantages. To start, soak organic wheatgrass seeds for approximately 8 hrs. before planting in moist soil. Place tray in indirect sunlight. Direct sunlight will dry the soil out and inhibit growth. A sprouting container works as well as the tray method and may even be easier. Once the wheatgrass is about about 7-8 inches tall it’s ready to harvest. Cut wheatgrass using kitchen scissors about a 1/2 -1 inch from the soil surface. Beware of mold. If mold occurs cut way above the mold. Make sure to rinse the wheatgrass before juicing. Typically, wheatgrass is only harvested once after the first cutting. It will grow back but does not contain the same amount of nutrients. Wheatgrass provides energy. Drinking about six ounces of it supplies the daily vitamin and mineral needs of an adult. It’s packed with chlorophyll and all sorts of energizing vitamins, which are many of the B vitamins. A teaspoon of wheat grass contains around 15mg of Calcium, 8mg Iodine, 3.5mg Selenium, 870mg Iron, 62mg Zinc, and plenty of other minerals. The chlorophyll content is 7 percent. It’s also filled with enzymes to help rid your body of toxins. It is recommended that you start with one ounce a day then work you way up to 2 ounces after a few weeks. Wheatgrass must be juiced in order to digest. The strong fibers of the grass are not digestible to humans unless juiced. Excess wheatgrass can be kept in an airtight container in fridge for a few days. It’s a simple cycle once you get the hang of growing your own wheatgrass. You’ll begin to familiarize yourself with how much juice a tray or sprouting jar yields. The cycle will help keep a daily supply available. I have yet to try a sprouting jar but plan to in the near future. There are also wheatgrass kits available to help get you started. Wheatgrass is also known to have healing powers for a number of ailments. 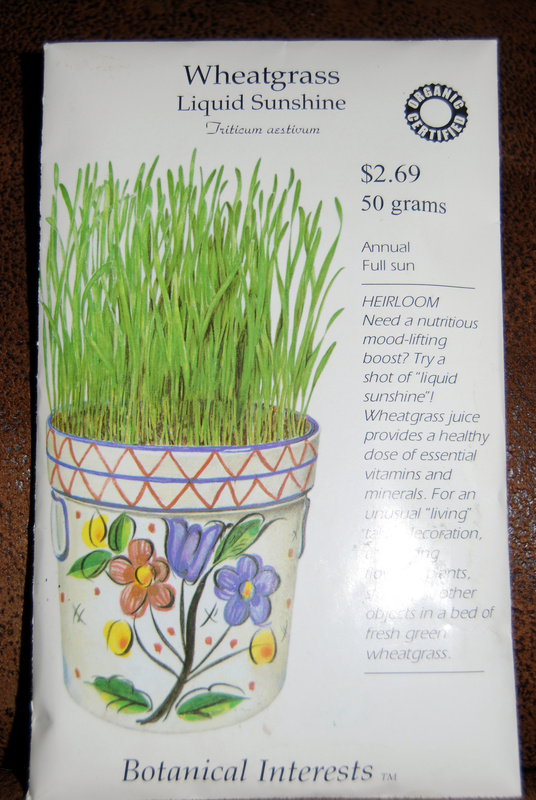 I recommend The Wheatgrass Book by Ann Wigmore which highlights the benefits of wheatgrass and how to grow it. The book also has recipes to incorporate it ( a great alternative should you not like the taste) and even mentions composting the wheatgrass mats! Having a supply of wheatgrass on hand is not only rewarding but it’s easy to do. Growing your own organic wheatgrass in these times, is the most economical way of obtaining a regular intake of this super green goodness! So, how do you “juice” it if you don’t have a juicer? Can you puree it with a food processor/blender? Is it just a case of pre-processing the fibre of the leaf?